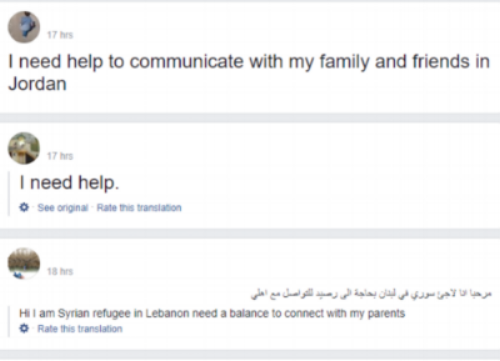 Our group allows refugees to request phone credit when they need it most. We take requests from all over the world. In the past year, we’ve had requests from Europe, Asia, the Middle East, and Africa. Our requesters come from a diverse range of ethnicities, nations, and religions, and range in ages from 7 to 90! Although we’d like to be able to support all refugees and displaced people, we have limited resources. Therefore, our focus is on helping those who are the most vulnerable - women, children, those sleeping rough or in dilapidated and overcrowded camps, and those who can’t receive financial support from local aid agencies or organisations. We provide top-ups for £10 and £20, depending on the requester’s circumstances, and offer this service on a monthly basis. Each request we receive is checked by one of our Admins, who verify that the requester has refugee status and checks their details against our database to ensure they are due for a top-up. In order to make a request, you must join our Facebook group. Once you are approved, you can make a request by making a new post on the wall. Your post will be moved to a ‘pending’ queue, and an Admin will send you a private message to take your details. Please do not make more than one post while you are waiting to be contacted by an Admin, as this can slow the process. It is our aim to process all requests within 5 days, although sometimes this is not possible due to the sheer volume of requests. Once an Admin has processed your request and taken your details, you will be added to our database ready for your top-up. Our usual waiting time for top-up is 1-2 weeks, although this can be longer when donations are low. To see these instructions in other languages, please click here for Arabic and here for Pashto. Our community of donors and supporters helps us to ensure that the money we raise helps refugees stay connected. All of our money comes from donations. We do not receive any funding or grants to support our work. We accept cash donations through MyDonate and Paypal, and also accept vouchers or codes for top ups. For more information on how you can donate, please click here. Our fundraising is done through our Facebook group on a weekly basis. This fundraising drive is known as the ‘conga’, and we encourage our community to ‘dance with us!’ every Friday - even if our members can’t donate financially, we encourage and appreciate their interaction and support. We also promote monthly direct debits, which can be set up here. Direct debits allow us to future plan, and help provide a sense of security for the most vulnerable requesters. Almost all of the money we raise goes directly to top ups, with a small percentage (less than 8%) set aside for operational costs. Since the group’s inception, we’ve been able to achieve roughly 0.48 top ups per group member. This means that for every three people in the group, at least one of them will donate. Therefore, it’s crucial that we raise awareness and help our group to grow. We encourage all of our members to add their friends and spread the word. The more people in our group, the more people we can help! To learn more about how you can help raise awareness and champion our cause, please click here. To ensure every donation reaches somebody who is genuinely in need, our Admin team take time and care to manage each application one-to-one with those requesting help. During the application process, applicants are asked to provide their personal GPS location, photos in real time of their current camp or accommodation, up to date asylum documentation and personal ID, Facebook URL, a screenshot of their phone's IMEI code, as well as their phone number and network. The information we gather is designed to be as non-invasive as possible, while still being comprehensive enough to offer a secure service in which donations are not lost to fraudulent applications. Each detail of each application is checked against our secure database before either a positive or negative answer is given. We embrace technology and deliver a quality service in partnership with our vendors and other refugee support advocates and agencies. As an organisation, we are volunteer led and run, and do not have any full-time employees. We currently have around twenty volunteers who help to process requests, top phones up, manage our social media accounts and marketing, and liaise with agencies on the ground. Our team is made up of both refugees and supporters, and greatly benefits from the diversity in age, religion, gender, culture, and background of our volunteers. To find out more about how you can help us, please click here. We are a charitable fund under the auspices of Prism, the Gift Fund. We have a Management Committee who meet regularly to oversee our finances, distribution, and to review our eligibility requirements. Safeguarding and Data Protection are a vital part of our work, and we have detailed policies outlining our responsibilities and commitments that our volunteers must adhere to. We partner with a number of different vendors who help us to deliver our service: Ewala, Senditoo, Sochitel, and Ding. Without these vendors, we would not be able to reach so many different countries and networks around the world. We also work closely with organisations on the ground, such as the Refugee Youth Service and Care4Calais. These partnerships allow us to reach refugees who may not have access to Facebook or who are in need or urgent assistance. If you are interested in partnering with us, please contact us here.